Gripping, hitting, throwing, catching diving…playing a sport demands 1000s of different movements from your fingers, hands and arms and sometimes injury is inevitable as a result. Whether you’re an amateur or a professional athlete, it is always important to protect your body from injury and stay healthy. That’s why Powerball should be in the gear bag of every sportsperson. Powerball is a world class product for sports injury rehabilitation, repairing and maintaining damaged muscles from your fingertips all the way up to your shoulders. Not only is Powerball highly beneficial for sports injury rehabilitation, but it also prevents injury by strengthening muscles, ligaments, and joints with its unique isometric resistance training. With Powerball, you can recover from your injury in a practical, easy-to-follow manner, while at the same time protecting your body from any risk of future injury. Turning your wrist against the isometric resistance generated by Powerball promotes the production of synovial fluid and boosts circulation around the upper body. Increased circulation means more oxygen-rich nutrients are carried directly to sore and damaged muscles, where they quickly work to soothe pain and repair muscle tissue. As the tissue is repaired, Powerball’s isometric resistance also begins to strengthen weak or damaged muscles. Isometric resistance is 100% non-impact, meaning it does not place any strain on injured muscles or joints. Repair + strengthening = faster recovery times and long-term results. If you are looking to reduce rehabilitation times, Powerball is the key. 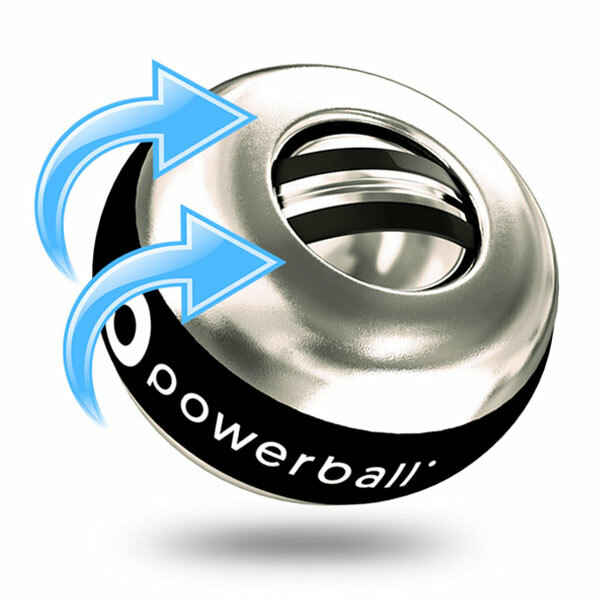 Use Powerball for efficient injury rehabilitation and get back to training in no time. 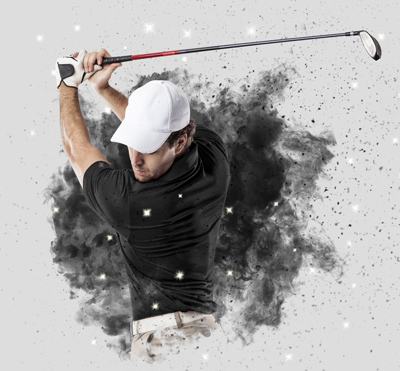 Effectively rehabilitate repetitive strain injuries (RSI), such as carpal tunnel, tendinitis, tennis/golfer’s elbow, etc. 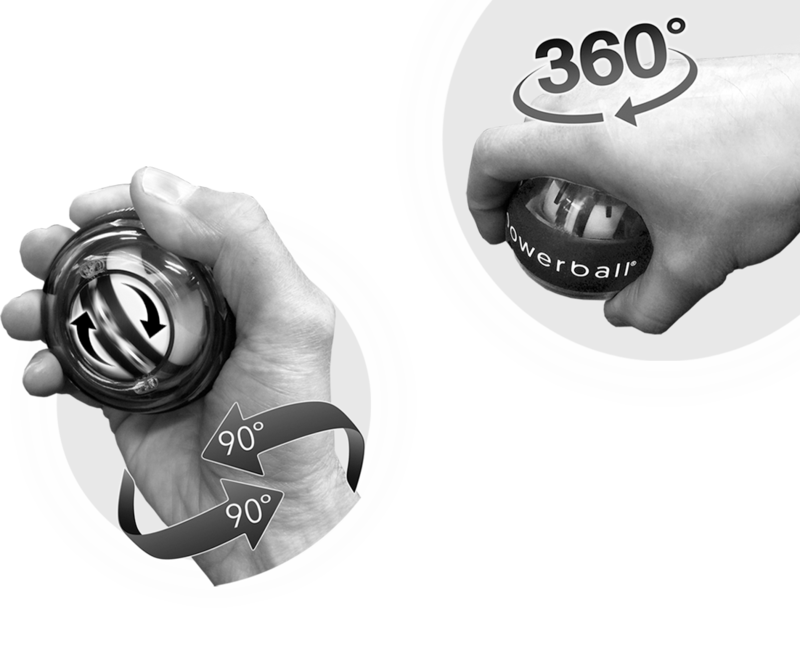 simply increase the intensity and spin speed of Powerball to start building incredible grip, wrist and arm strength. Use this tennis-ball-sized gym for strengthening, warming-up/down and prehab. The powerful resistance training created by Powerball works its way throughout the entire upper body, dramatically improving muscle strength and endurance power. Even the fittest, strongest athlete will wince from the lactic acid burn in their forearm the first time they spin Powerball with aggression. Increased forearm and grip strength plays a big part in developing the control and stability required to play most sports. Use Powerball daily and begin to see results in your technique in no time. Working your wrists, fingers and arms against the isometric resistance generated by Powerball will sufficiently warm up the muscles across your entire upper body. Spin Powerball before you train for an effective warm up regime and benefit from increased flexibility and greater overall range of motion. Experience strong, flexible mobility and boost your technique with regular use of Powerball. Using Powerball for just 3 minutes each day will effectively rehabilitate any sports injury from the fingertip to the shoulder. Follow our physio-designed exercise programmes to target specific muscle areas and get the best results. Below you can watch our wrist rehabilitation video with accompanying easy-to-follow rehab programme. See the full list of rehab videos and programmes available on our videos page. There is a Powerball to suit everyone’s budget available in-store. Check out our full range of strength and rehabilitation products today and experience the results for yourself. Powerball is revolutionary for sports injury rehabilitation and prevention, making it a must-have product for all athletes. Used by professional athletes & physicians to speed up recovery and build strength.